Gmail Labs added two new experimental features: a "Mark as Read" button and a very basic script that warns if you write about attaching documents but you forget to actually attach them. The attachment detector couldn't recognize patterns like "I attached a file", "Check the attached file", but it worked when using: "I've attached..." and "I have attached". Greasemonkey scripts like Gmail attachment reminder find their way in Gmail Labs and you no longer need to use Firefox or install a certain extension to use them. FINALLY, the "Mark Read" button, i've been waiting for it since AGES* !!! This sounds pretty familiar. 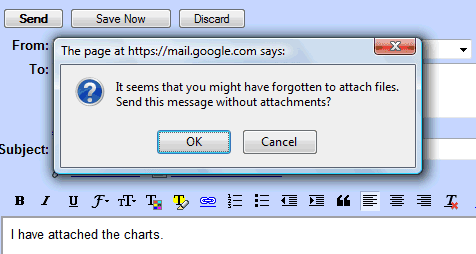 Didn't GMail used to do this years ago? Did they take it out, and just now reimplement it? I don't think so. Maybe you installed a Greasemonkey script or an extension like Better Gmail. US Patent US7016937 makes me sad. What's next - one-click checkout? Oh wait. While reading mails "Mark as Unread" button would be nice too. I thought they also added it. I looked for it for a time as if they did. I read the post and it mentions only "mark as read" button. I am so disappointed. Hear me Gmail! I also want "Mark as Unread" button. I don't want to use dropdown for the features I use most. I, too, would like a "Mark as Unread" button. This feature is pretty useless if I have to type the exact phrase "I have attached". If I can remember to type that I might as well remember to attach the file. In french, there is a detection problem. If I says that a friend should join a mailing list or a group, with such a sentense: "Pol s'est joint au groupe", then there is a faulty positive detection of an attachement file. This feature cannot be disabled in the Lab config page, which is a problem for me. I don't like this new feature. Attachment detector failed with "... a look at attached resume and let ... "